What doesn’t Vaughn write? Urban Fantasy (the recently completed Kitty Norville series), YA (Steel about Time Travel and Pirates, Voices of Dragons about Dragons, duh), Super-Heroes (The Golden Age series, and something in the Wild Cards series). I’m at the point where I don’t even bother to see what her books are about, I just see her name and buy. I’d say start at the beginning with the Kitty books: Kitty and the Midnight Hour and read through. If you’re not in the mood for that much of an investment — After the Golden Age is a great take on classic super-hero types. 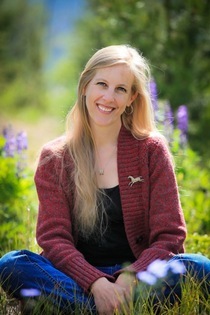 She blogs over at Filling the Well, and you can learn more about her at her official site. Easy title to live up to, no? 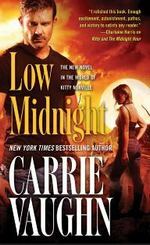 About the same time that I posted my review of the previous book, Low Midnight, where I talked about “future Kitty novels,” Carrie Vaughn announced that this one would be the end. So much for my predictive ability. Now, at the end, I see that Low Midnight was well-placed in the series, and I have a better understanding of the role it played in setting up this book. Which is not to say that I wouldn’t have preferred a few more books in this series, but if Vaughn had to end it now, I’m glad she did it like this. This couldn’t be less obvious a last novel. Kitty name checks and/or visits everybody we’ve met along the way, it’s like the last few minutes of “The End of Time” before The Doctor regenerates into Matt Smith. But Vaughn does it so smoothly, it’s only when you stop and think about who’s shown up that you even notice what she’s done. I don’t really have much to say about this — it’s the 14th and final novel in a series. Don’t let this be the first one you read — do let this be the last. Start with one of the first few (if not the first, Kitty and the Midnight Hour). This is different than the rest of the series, not just because it’s the end. There’s plenty of action to be found — not a lot of time for character development, growth, relationships, new characters (well, maybe a couple) — it’s all about Regina Luporum and her allies versus Dux Bellorum, anything else is a distraction (however pleasant a distraction). Which isn’t to say that the characters are unimportant — it’s Carrie Vaughn, characters are the core. But they’re very busy here, and don’t have a lot of time to chat, reflect, or anything like that — they have a world to save. The final showdown with Roman didn’t go as expected, but better. The scenes following that were great, and the ending was everything a fan could hope for. One criticism — and, now that I think about it, this applies to the series as a whole — Kitty tells us time after time that her pack is what’s important, it drives her restaurant/bar New Moon, it keeps her in Denver, it’s what motivates her, blah, blah, blah. But really, outside of the occasional chat while picking up an order with Shaun and references to the group hunting on the Full Moon, we don’t see them. The pack that Kitty cares about is the other one — Ben, Cormac, Amelia, Alette, Odysseus Grant, Tina, Rick, Matt, and the others that fill her life and align themselves with her against the Long Game. I’d be fine with it if Kitty were just a little bit more honest with herself/us about it. I’m going to miss Kitty, Ben, Cormac and the rest, and the next year is going to feel a little strange not getting any new adventures from them. But this was a great way to say goodbye. 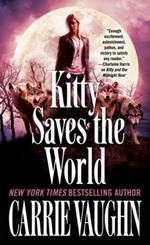 While starting the post for Kitty Saves the World, I noticed I’d reviewed only two other books in this series here. Unthinkable. It was one of the first UF series I ever tried and it’s one of my favorites to this day. Turns out, that somehow I’ve only written one other post on the series. I’m still having trouble coming to grips with that. So, I figured I’d better throw this up before I forgot. Mass Market Paperback, 307 pg. It’s been far too long since we’ve had a new Kitty Norville adventure, and Carrie Vaughn didn’t disappoint with this one. We begin with Kitty’s most recent hobby–trying to out historical figures as weres or vampires or whatever. Which is a lot of fun, and is a well Vaughn hopefully returns to. But the main action focuses on the Long Game between various vampire factions that we’ve seen a few peaks into lately. Kitty’s ally Anastasia is racing against Roman for possession of a magical artifact that could turn the tide in this competition forever. Honestly, I don’t think this was the strongest entry in the series plotwise–this seems more about setting the stage for bigger things down the road. But while setting the stage, we get to spend some good quality time with some great characters, learn more about Cormac’s situation, and meet a few new characters (a couple of which I hope to see again, soon). Should add that it took me far too long to get the title, and when I finally did I wondered where my head had been for a couple hundred pages. Can’t wait to see what trouble Kitty gets into next. Mass Market Paperback, 309 pg. Ahh, the fans (some of them, anyway) get what they’ve been wanting — a novel featuring everyone’s favorite retired monster hunter (and the deceased Victorian witch who’s living inside his brain). 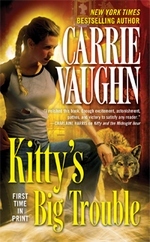 The thing Vaughn did that makes this stand out is that unlike most authors, rather than give Cormac some side story, she gives his solo adventure a central place in the overall storyline — what happens here will play a big part in what happens in future Kitty novels. This is honestly not at all what I expected from a Cormac novel. I expected more violence — not necessarily a blood bath, but more guns, more offensive magic — and less discussion of meadows. But he’s grown — moreover, he’s doing what he can to live as a law-abiding ex-con (especially one with Ben looking over his shoulder all the time). So no guns. Brains over brawn, which seems to be stranger for Cormac than it is for readers. The plot was meager, honestly. The story was mostly just an excuse to see Cormac in his element — get to know him better, get a fuller picture of his past and to watch the way that he and Amelia work together. And as such, the novel succeeded. As a story about Cormac and Amelia investigating a century-old death by magic, it was tolerable. The strongest part of the book was their relationship, the way they’ve learned to work — and exist — together. There’s genuine affection between the two — a little mistrust (which makes sense, given their unusual situation), but genuine affection. Given how we’re introduced to Cormac, that’s pretty serious growth. At the end of the day, this was a nice diversion — a good way to get a different look at things, to see the people who aren’t Kitty engaged in her crusade, and to get to know these characters better. I’d probably enjoy another book focused on Cormac and Amelia, but I’m looking forward to getting back to Kitty’s POV. 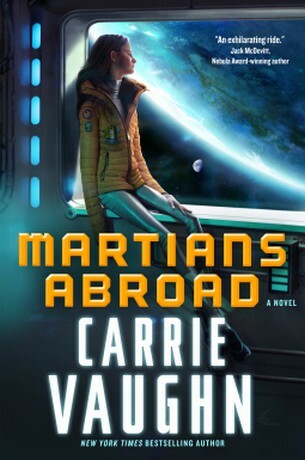 I’m a little surprised at my rating for this one — not that Vaughn’s not more than capable of writing a four or five-star book — but based on my reactions while reading which were definitely not favorable. But my reactions were strong enough — based on the claustrophobic note frequently struck here, and how much I cared about what Kitty was doing/going through — that I knew Vaughn had delivered. Hadn’t necessarily written the book I wanted/expected, but she got the job done very effectively. N.B. I get vaguely spoilery beyond here — I don’t think it’s too terrible, nothing I’d really have minded reading before picking up this book. So the idea behind Kitty Drinks the Kool-Aid in the Underground is that while some vampires, and Kitty herself think the whole Regina Luporum thing is a joke, there are some who take it very seriously. So seriously, that they kidnap Kitty to get her assistance in making a major attack on Roman/Dux Bellorum. Now, this may strike you as a particularly stupid way to get someone to help you out — as it should, it definitely strikes Kitty that way. But for whatever reason/delusion, her kidnappers don’t see it that way. Now, over the last 11 books, we’ve seen impetuous Kitty, rash Kitty, leaping-before-she-looks Kitty — and while Ben and Cormac grit their teeth and fret, the reader just smiles, content in our knowledge that this is just Kitty being Kitty. However, in Kitty gets Stockholm Syndrome in the Underground we see Kitty being just stupid. She gives a magic user (that she doesn’t know) access to her blood. She lets a strange vampire feed off of her. She passes up chances to escape. She lets her guard down with her captors. Now, Kitty’s generally quick to trust — which is part of her charm — but she generally has some sort of basis for that. Not here. Well, at least no rational basis. Here’s she’s just so desperate to take down Dux Bellorum, that she throws reason and caution to the wind. She spends large amount of time being rational, thinking things through, reacting as she should — and then she seems to shut that down to work with these people. I talked back to the book a lot (this is a behavior I don’t typically engage in at all). My favorite werewolf had taken leave of her senses and was risking it all. This book should’ve been twice as long (at least). Kitty needed more time in the cave before she acted the way she acted. The reader needed to get a better idea of the rich and colorful characters that were introduced here. It would’ve been nice to see Kitty’s pack at work trying to find and rescue her. So much of what was going on in this book was new, terribly interesting, and worthy of exploration, it’s a shame we didn’t get the chance. Although, a longer book would’ve likely given me a stroke. So I shouldn’t complain. For all my gripes, it was a tense, taught adventure that will have interesting (to say the least) ramifications going on. Now I have to start counting down for the next one. Can’t come soon enough. I knew that crime fiction would come up with someone to dethrone Lisbeth Salander as reigning Queen Bad*ss, but I never woulda figured it’d be someone like Stella Hardesty. Sure, Lisbeth could take Stella in a steel cage match–but in an extended campaign, that little girl wouldn’t stand a chance, Stella’d kick her Asperger’s all the way back to Sweden. The case at the center of this book seems pretty straightforward–the jerk in question seems to need (and respond to) some encouragement to stick to the behavior plan that Stella’s lined out for him–like she expected, but lo and behold, he ends up kidnapping his ex’s kid. Given the subject matter, this book obviously goes to some pretty dark places. Yet this story is told with a lot of wit and charm–a few laughs, too (particularly as a mutual attraction grows between Stella and the new Sheriff). It doesn’t take long at all to really like Stella and get invested in her crusade, as well as this case. Just can’t wait to get my hands on the sequel. This should make up for my less than glowing review of Vaughn’s last book (the fun Steel). 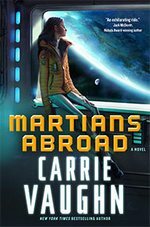 This is the best novel Carrie Vaughn has published–and that’s saying something. Beyond paraphrasing the book description, or spoiling the whole thing, I can’t think of anything else to say.